Command Sergeant Major Robert Stiefvater enlisted into the United States Army in October 1983 and attended Advanced Individual Training as an 11B (Infantryman) at Fort Benning, Georgia; later enlisting into the Louisiana Army National Guard in December 1990. 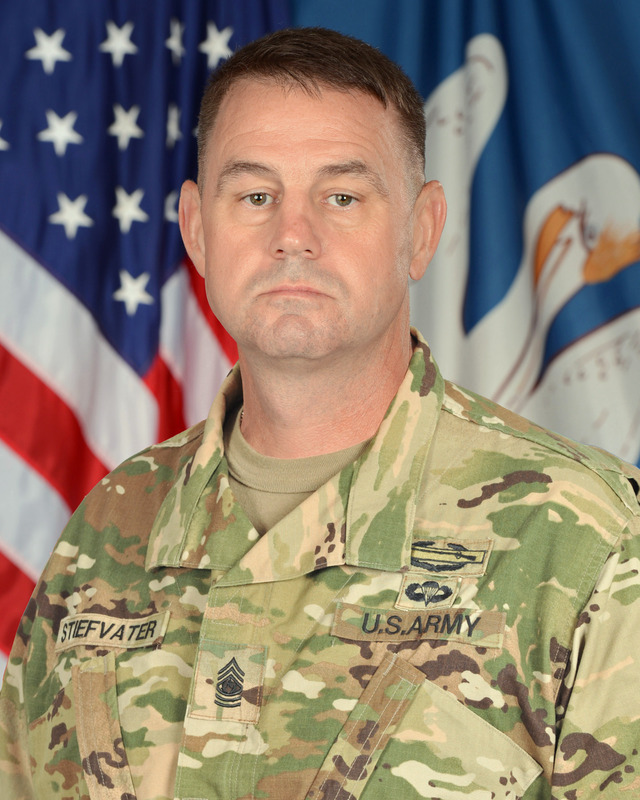 Throughout his career, Sergeant Major Stiefvater served in positions of leadership to include Infantry Squad Leader, Bradley Commander, Platoon Sergeant, Operations Sergeant, First Sergeant, Battalion and Brigade Command Sergeant Major. Sergeant Major Stiefvater served as Battalion Command Sergeant Major for the 1st Battalion, 244th Aviation (November 2000 to November 2001); 1st Battalion, 141st Field Artillery (November 2001 to November 2005); and 3rd Battalion, 156th Infantry (November 2005 to May 2007). Sergeant Major Stiefvater also served as Command Sergeant Major for the 139th Regional Support Group (May 2007 to March 2010) and 225th Engineer Brigade (March 2010 to June 2013). His last assignment was as the Louisiana Army National Guard Senior Enlisted Advisor. Sergeant Major Stiefvater mobilized in support of Operation Iraqi Freedom 2004-2005 as the Command Sergeant Major for 1st Battalion, 141st Field Artillery. In support of state of emergency operations, Sergeant Major Stiefvater served as Task Force Command Sergeant Major for Task Force Orleans, Task Force West, and Task Force Knight during Hurricanes Katrina (2005), Rita (2005), Gustav (2008), Ike (2008), and Isaac (2012). He also served as Task Force Command Sergeant Major during Deepwater Horizon Oil Spill (2010) and Operation River Guardian (2011) with the 225th Engineer Brigade. In June 2013, Sergeant Major Stiefvater was selected to serve as Senior Enlisted Advisor Army. Sergeant Major Stiefvater is a graduate of Northwestern State University. His military education includes the Primary Leadership Development Course, the Basic Noncommissioned Officer’s Course, and the Advanced Noncommissioned Officer’s Course. He is a graduate of the United States Army Sergeants Major Academy (Class 26). Sergeant Major Stiefvater’s awards and decorations include the Bronze Star, Meritorious Service Medal with 4 Oak Leaf Cluster, Army Commendation Medal with 3 Oak Leaf Cluster, Army Achievement Medal with 4 Oak Leaf Cluster, Good Conduct Medal, Reserve Components Achievement Medal with 4 Oak Leaf Cluster, National Defense Service Medal with 1 Bronze Service Star, Iraq Campaign Medal with 3 Bronze Service Stars, Global War on Terrorism Medal, Armed Forces Service Medal, Humanitarian Service Medal with 1 Oak Leaf Cluster, Armed Forces Reserve Medal with Silver Hour Glass and “M” Device, Noncommissioned Officer Professional Development Ribbon with Numeral 4, Army Service Ribbon, Oversees Ribbon, Multinational Force and Observers Medal, Combat Infantry Badge, Expert Infantry Badge, Basic Parachutists Badge, Honorable Order of Saint Barbara, The Bronze Order of the De Fleury Medal, Louisiana Distinguished Service Medal, Louisiana Legion of Merit with 2 Fleur-de-lis, Louisiana Cross of Merit with 2 Fleur-de-lis, Louisiana Commendation Medal with 1 Fleur-de-lis, Louisiana Recruiting Ribbon, Louisiana Retention Ribbon, Louisiana War Cross, Louisiana Cold War Victory Medal, Louisiana Emergency Service Ribbon with 2 Fleur-de-lis, Louisiana General Excellence Medal with 4 Fleur-de-lis, and the Louisiana Longevity Ribbon with 3 Fleur-de-lis. Sergeant Major Stiefvater resides in Pineville with his wife, the former Teresa Malone of Pineville, Louisiana. He is also father to three children: Corey, Christin and Emma.